BO: I live in the farming and ranching community of Powell Butte, 35 miles NE of Bend, Oregon. With one awesome Pudelpointer for pheasants, chukkar, ducks and companionship. TR: What about a boat? Fishing for this many years you must own a boat, right? BO: One Grumpy Old Man metal 12′ lake boat, one Clackacraft 16′ drift boat, several Aire rafts and pontoons, one 10′ pram, one canoe, one 10′ row boat, one ancient Boston Whaler. BO: I worked in a fly shop in Bend, Oregon in 1976. I guided from 1977 to 1981. I started as a fly tackle sales rep in 1981. TR: You started out as a guide, right? BO: I started in 1977 as an outfitter/guide on the Deschutes River, the North Santiam River, the North Umpqua River, the Klamath River in California and a couple years in the Bristol Bay area of Alaska. TR: Are you still a guide or do you just rep and shoot now? What companies? BO: Neither. I quit guiding in 1981 and I walked away from my rep career in 2007, after many rewarding years. For work, I produce Catch Magazine with Todd Moen, I have a small role with Scientific Anglers, Cabela’s, International Sportsman’s Expos and Idylwilde Flies and I still sell photos, do fly club presentations and work at sport shows. BO: I was given a Kodak Instamatic for Christmas, the first point and shoot, when I was in the 6th grade. I took photos of fish laying on the ground next to my Fenwick rod. At the time my mother was an art teacher at the University of Washington and I was exposed to a lot of art galleries, shows, exhibitions, museums, etc. As a kid, people seemed to like my fish photos, or at least pretended to! I took that little camera everywhere. I still have photos of me and friends with stringers of crappie, my first steelhead from the North Umpqua in 1971, the same Fenwick rod, and other classics. BO: Yes, I took a photo with my Instamatic, when I was 16, that was published in a local newsprint fishing magazine. Then, in 1973, I went to New Zealand, right out of high school, and took a cheap Minolta SLR and I shot slide film. The photos were pretty good and I did my first fly club presentation, to the Deschutes River Chapter of Trout Unlimited, with those photos in 1976. I had a string of fly fishing magazine covers starting in 1977 and really ramped up the photo effort while guiding in Alaska after that and accidently running into Val Atkinson, my hero at the time (sorry Val!). BO: Fly Fisherman, Fly Rod & Reel, American Angler, Gray’s Sporting Journal, Fly Fishing and Tying Journal, Fish & Fly, The Drake, Saltwater Fly Fishing, Fly Fishing in Saltwaters, Northwest Flyfishing, Eastern Flyfishing, Cabela’s Outfitter Journal, Men’s Journal, Outside, Field & Stream, Outdoor Life, USA Today, LA Times, Miami Herald, Fish Alaska and many more magazines here, and in Europe and Japan. I have contributed to many product catalogs and retail catalogs: Kaufmann’s, The Fly Shop, Feather Craft, Patagonia and many more. I have contributed to over 100 books from around the world. Many websites and blogs and dozens of calendars, post cards, posters, product banners, trade show booth graphics, fly tackle packaging, ads, etc, etc. TR: I should have asked where you haven’t been published. That’s quite the list! BO: Todd and I started Catch Magazine with our premier Issue in September 2008. We wanted an on-line, gallery-style magazine that showed the best fly fishing photography and video in the world. Catch Magazine comes out on the first day of every odd numbered month, it is free and we have subscribers and readers in 129 countries and in over 6,000 cities and growing fast. 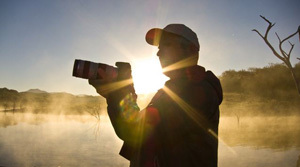 TR: What is the craziest trip you’ve ever been on in regards to photography and fly fishing? What happened? BO: I was on a tropical trip to do video and shoot stills (the premier issue of Catch Magazine cover) and one day I was doing underwater video photography of permit, 50 feet deep. While I was under, a storm blew in and the dive boat lost me. I came up after 45 minutes to huge breaking waves, no boat and no land in sight. After almost three hours of swimming I found a small reef with a navigation light on it. I waited there and finally the dive boat saw me. It was a close one. There are many more, from rattlesnakes to poachers in Honduras who wanted my boat, to cyclones in the Indian Ocean that blew our boat off anchor and out to sea without us being on it, bears in my face, problems with the military in Kashmir/Pakistan and Venezuela, problems with the police in the Bahamas, Baja and Brazil and health issues like Dengue Fever, boat mishaps, car mishaps, airplane mishaps, etc, etc. TR: If you could go one place in the world and fish, where would it be? BO: That answer changes yearly, but right now I am on a golden dorado tangent. I lost a 35-pounder in NW Argentina and want to go back and settle the score! BO: The most productive trip I have ever had was to southern Chile, at Estancia del Zorro. The fishing was epic, the weather and situations were great and the scenery, condors, food and wine was never ending! BO: I use less equipment than most hobby photographers. I came back last night from a week of fly fishing for bass in Mexico and in one Pelican case I had an old Canon 20D camera, a Canon 70mm-to-200mm 2.8 lens (oldie but goodie) and a Canon 10mm-to-22mm 3.5 lens. I have a simple flash, two extra batteries and four memory cards. I also took a Nikonos V underwater film camera and an Olympus point and shoot. My gear is almost worthless on eBay and someday I would really like some hot new cameras and lenses. BO: 1. Avoid structured hero/grip and grin photos. Get one, maybe two, then turn your attention to the “other stuff”, like fish close ups, wide scenics, funky weather, new angles, fun casting shots, the tackle, food and beer, etc. 2. Keep your lens clean. 3. Hold your camera still, very still. I use rocks, tree stumps, fence post, car hoods, a lot. 4. Shoot with more than one lens. 5. Go to pretty places!